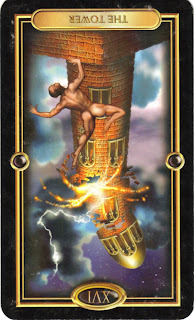 Today's card is The Tower (reversed). When I pulled this card, it reminded me of when I was going through my divorce and this card kept coming up. But then the card was in its upright position, which means the collapse of a structure, a way of life an awakening and a major transformation. Everything I thought I knew was being tested. It was tough, but it is also an invitation to see the world differently and gain insight. Even the image on The Tower can be frightening. Bodies are flying out of a tower that is burning. Dark skies loom behind and there is an inevitable feeling of dread that the bodies will hit the ground and the structure will crumble. As I type this, it reminds me of what happened to the World Trade Center on 9/11. But today The Tower is reversed, which means the transition has already begun to take place. It was a complete shock, but you are past the point of immobilization and fear and have started moving forward. The instability you felt as the Tower crumbled was most likely in direct proportion to how much stock you put in the structures and beliefs you had in place. The more you depended on how you put your world together, the more disappointed you felt as you experienced this huge shift. The Tower (reversed) indicates that the trauma is over and you have begun to move on. As you look back at the "mess," and can so clearly remember how bad it was (and possibly still is), what are some of the benefits of what has happened? No matter how bad it seems, take a moment now to come up with at least three benefits, even if one of them is the fact that it is over. Stay focused on the positives as you move forward and remember that life is full of cycles. Move forward from here with an eager heart and know that "this too shall pass." You are stronger now and will gain even more compassion as you heal. How totally perfect for me. My dear Brewzer pasted last Sunday in a freak accident and I didn't think I would ever heal from my lose. I know people say, he was just a dog, but to me he was my world. It felt like my world was crashing down and I just couldn't function without crying. One week later, I am finally starting to heal. I can walk into my house without crying that he is not there to greet me at the door. I learned so much from him. Love unconditionally, never take the people you love for granted and live like you were dieing. This morning I pulled Tarot cards for myself. The question I had was, how do I move through my self-imposed blocks in order to move in the direction of my dreams. I told the universe I felt like I have been holding myself captive and I want to know what I can do to move through this. One of the cards I pulled was, you guessed it, The Tower Card upright. The guidance that stood out most for me on this card as I read the book was, "Release from self-imposed beliefs." This was perfect seeing as how that was my question. However, it felt as though I was in a waiting position for this transformation or movement forward. I felt compelled to check my emails and there you were with The Tower Card Reversed. As I read, I immediately knew the universe was letting me know, in my act of surrdender I released my self-imposed captivity and I am allowing the transformation to happen. I feel like I might be in between the tower up-right and the tower reversed, but now matter what forward progress is happening. I just love how the universe flows so perfectly. With the simply choice to surrender and move forward I am already releasing myself from my own self-limiting garbage. 1) It inspired me to seek out alternatives like acupuncture, TCM, naturopathy and DHEA, which have improved my overall wellbeing. 2) These alternative approaches will also increase my chances of conceiving naturally or becoming a candidate for IVF. 3) I started my blog on the day the tower fell, and found the best therapy and support I could possibly have to get through whatever comes next - I love the friends I have made here. Thanks so much for pulling this card and giving me the chance to reflect on this. Go Kart accident! It shook my husband out of imbalance, possibly. Reprioritized everything. Brought us closer with friends and family, and opened us up to vast generosity. How interesting that this card came up so close to 9-11. There's a leap I haven't made yet, and so the appearance of this reversed card isn't intuitively obvious--a bit perplexing. I remember last summer just about this time you pulled this card for me, among others. The High Priestess was there too. Maybe it's like painting--the prepping takes twice as long as the actual painting. Last week my counselor, my high priestess, commented on remarks I've made before about knowing I have a change coming, but "don't have a plan". She said she was reminded of a baby in a womb who at some point notices "it's getting a little small in here." When I say I haven't a plan, I mean that nothing has been nudging me forward down the birth canal...still awaiting cues. Then wondering if I'm just procrastinating. So, is the tower really reversed for me? Or still ahead? I don't know. It's funny that you pulled this card. I have just started to feel like I can roll with life again, that everything will be ok. My last IVF cycle, the Tower fell for me. Now, I'm on the verge of doing another cycle. I don't feel like trauma is ruling me like before. However it turns out, I feel better prepared to deal with whatever happens.